The RadDiagramRuler is used to provide visual indication about the diagram viewport coordinates. It resides in the Telerik.Windows.Controls.Diagrams.Extensions namespace. The RadDiagramRuler exposes a Diagram property which is used to associate the ruler with a particular diagram instance. The ruler uses this instance to collect the required information about the current viewport (position and size) and the zoom level in the diagram. Please note that the examples in this tutorial are showcasing Telerik Windows8 theme. In the Setting a Theme z article you can find more information on how to set an application-wide theme. The structure of a RadDiagramRuler is pretty simple. It consists of four types of ticks - each used to display a different measurement unit and a label. XSmallTick - the smallest ticks available in the ruler. Label - the Label is used to display text describing the measurement unit value. All of the above visual elements are described by the DiagramScaleItemDefinition class. Essentially the content of the RadDiagramRuler control describes a single scale that displays different scale items. The scale items describe the measurement units and they are calculated based on the zoom level of the associated RadDiagram object. You can easily configure the scale definitions and items to better match your scenario, using the RadDiagramRuler properties. Left - rotates the ticks and labels and aligns them to the right of the ruler. Right - rotates the ticks and labels and aligns them to the left of the ruler. Dip - represents device independent pixels. This is the default measurement unit used by the RadDiagramRuler. ScaleDefinitions - this property is of type DiagramScaleDefinitionCollection and it describes a collection of DiagramScaleDefinition objects. 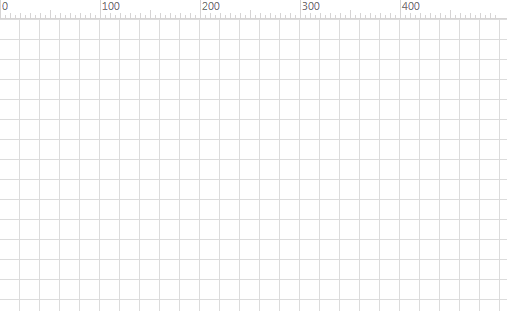 Each DiagramScaleDefinition object describes a scale in the ruler. In the above sample we've create three DiagramScaleDefinitions. The MaxZoom property of type double sets the maximum zoom level of the RadDiagram for which a scale will be displayed in the RadDiagramRuler. The first DiagramScaleDefinition will be displayed in the RadDiagramRuler when the associated Diagram zoom level is under 1. In this case, the ruler will display three types of ScaleItems - small ticks to indicate each 10th pixel; medium ticks to indicate each 50th pixel and large ticks to indicate each 100th pixel. Next to each large tick, a label will be displayed to show the measurement unit value. The second scale definition will be displayed when the zoom level in the RadDiagram is between 1 and 2 and it adds one more item to the ruler - extra small ticks which indicate every 5th pixel of the RadDiagram viewport. The sample also demonstrates how to apply a default scale (without setting the __MaxZoom__property) definition to be used for zoom levels which don't have a manually defined scale definition. The Interval property is of type double and it represent the recurring interval that controls how often the item will be displayed on the RadDiagramRuler surface. Note that the value of this property is interpreted based on the measurement unit defined in the ruler. XSmallTickContainer - a container that visualizes the DiagramScaleItemDefinition of Type XSmallTick. SmallTickContainer - a container that visualizes the DiagramScaleItemDefinition of Type SmallTick. MediumTickContainer - a container that visualizes the DiagramScaleItemDefinition of Type MediumTick. LargeTickContainer - a container that visualizes the DiagramScaleItemDefinition of Type LargeTick. LabelContainer - a container that visualizes the DiagramScaleItemDefinition of Type Label. The described containers are used to control the visual appearance of the ticks and labels. This is why if you need to customize the default Style or ControlTemplate of a tick or a label, you'll need to create a Style targeting the appropriate visual container.